This aired on Samurai TV so there may be some clipping. All the wrestlers have profiles on Joshi City, you can click on their names above to go straight to it. The show kicks off with a “High Speed” match, meaning Natsuki Taiyo is the referee and the match will be fast paced/random. I really think Natsuki misses wrestling herself from the way she acts in these matches, still not completely sure why she stopped. Anyway, both of these teams have some interesting elements. I am excited to see Makoto again, since REINA closed I haven’t seen her as much but she’s always entertaining. Tsukasa is the ‘biggest’ wrestler in this match and seems miscast as she is one of the biggest stars of Rice Ribbon, while Aoi Kizuki is nearing her retirement at the time of this match. The other team has wrestlers from three different promotions, with Ayame (K-DOJO), Mio (Marvelous), and Miyuki (Actwres girl’Z) creating a unique trio. Miyuki and Aoi are the first two in, they immediately run the ropes before Natsuki joins them and the go back and forth. They (all three) trade holds before reaching a stalemate, and we clip ahead a bit to all six being in the ring. Team Aoi is in on control as they stack their opponents on top of each other and pose, Aoi elbows Tsukasa for reasons unknown before Ayame (who is apparently legal) continue the attack on Tsukasa. Team Miyuki take turns tagging in and slamming Tsukasa, Ayame puts Tsukasa in a crab hold while Miyuki comes in to help, but Tsukasa makes it to the ropes. Mio also finds her way into the ring but Tsukasa dropkicks all of them and tags in Makoto. Makoto hits a face crusher onto Makoto and Ayame before DDTing Miyuki, cartwheel kneedrop by Makoto but Miyuki catches her with a powerslam. Irish whip by Miyuki but Makoto reverses it, dropkick by Miyuki and she goes to the second turnbuckle before hitting a diving elbow. Mio comes in as the legal wrestler, Mio hits Makoto in the back of the head until Makoto slaps her, but Mio catches her boot and swings her foot into Natsuki. Dropkick by Mio and she hurricanranas Natsuki onto Makoto, cover by Mio but it gets two. Tsukasa and Natsuki get into it until Makoto boots Natsuki and she rolls out of the ring, Aoi and Mio come in and Aoi hits a lariat. Running senton by Aoi and she covers Mio, but Natsuki hasn’t returned yet. Aoi applies a backbreaker to Mio before Tsukasa runs in and hits a dropkick, Mio fights them both off however and makes the tag to Ayame. Ayame goes up top and hits a missile dropkick onto Aoi, cover by Ayame but it gets two. Aoi sneaks in a few cradles as they trade flash pins, Aoi goes off the ropes and hits a jumping lariat before suddenly leaving the ring and running around the stands. She slides in and covers Aoi, but it gets two. That’s just part of the wacky High Speed vibe. Aoi goes up top but Miyuki tosses her off and hits a vertical suplex, Ayame then slaps Aoi before Mio hits a diving crossbody. She can’t cover her since she hasn’t bounced off the ropes yet, all of Team Miyuki go off the ropes but Tsukasa and Makoto run in to knock all three to the mat. Tsukasa stays in with Ayame, Yoshi Tonic by Tsukasa and Aoi comes off the top with a Swivel Body Press. Aoi goes off the ropes a bunch and covers Aoi, and she gets the three count! Aoi Kizuki, Makoto, and Tsukasa Fujimoto win! For what they were going for, this was fun. The “High Speed” rules (having to go off the ropes or apparently around the arena before making a pin) would confuse newer viewers but since its just a silly thing it doesn’t really matter anyway, its designed to be a playful match. I always enjoy Natsuki herself getting involved as she tends to do, she still has the same speed and ability as she always had, still hopeful this leads to a match for her one day. An easy to watch opener, and it was nice to finally get to see Makoto again. 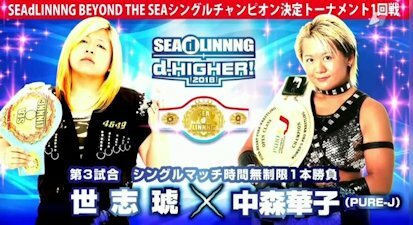 This match is part of the first round in the SEAdLINNNG Beyond The Sea Title Tournament. The tournament begins with two wrestlers that are affiliated elsewhere, as Takumi Iroha wrestles out of Marvelous while Ryo Mizunami hails from Pro Wrestling WAVE. Ryo is the more experienced of the two as she debuted back in 2004, she is a former champion in WAVE and a former tag team champion in several different promotions. Takumi held the top title in WAVE this year so both come in with previous championship history, leaving this one a real toss-up on who will advance to round two. They circle each other to start as they feel out the situation, they go into a Test of Strength but neither budges. They trade strikes, snapmare by Takumi and she kicks Ryo in the back but Ryo quickly gets up and elbows Takumi repeatedly. Ryo hits a hard shoulderblock, she picks up Takumi and hits more elbows, cover by Ryo but it gets two. She picks up Takumi but Takumi flips away and hits a kick combination, Ryo catches one of her kicks and Irish whips Takumi but Takumi delivers a heel kick. Takumi gets Ryo around the waist and superkicks her in the back of the head, release German by Takumi and she dropkicks Ryo for a two count. Vertical suplex by Takumi, she goes up top but Ryo recovers and joins her, Ryo grabs Takumi and powerslams her to the mat for a two count. Ryo picks up Takumi but Takumi gets away and hits a Liger Bomb for two. Takumi goes up top and hits the Frog Splash, she quickly goes back up top again and this time delivers the Swanton Bomb, but Ryo barely gets a shoulder up. Takumi applies a sleeper hold but Ryo slams Takumi to get out of it, Takumi goes off the ropes but Ryo catches her with a lariat. They both slowly get up and trade elbows, Takumi wins the exchange and picks up Ryo, but Ryo elbows and headbutts Takumi repeatedly. Spinning heel kick by Takumi but Ryo hits a lariat followed by a uranage. Takumi superkicks Ryo but Ryo fires back with another lariat, she picks up Takumi and hits the dragon suplex hold, but Takumi kicks out. Ryo charges Takumi and hits a lariat, but Takumi barely gets a shoulder up. Ryo goes for the Hot Limit but Takumi reverses it into a sleeper hold, Ryo almost reaches the ropes so Takumi releases her to pull Ryo back to the middle of the ring. Takumi quickly re-applies the sleeper, this time with a bodyscissors, and Ryo goes unconscious leading to the referee calling for the bell! Takumi Iroha advances to the next round. 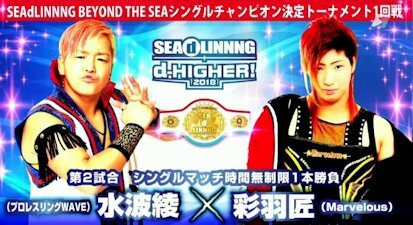 This match is part of the first round in the SEAdLINNNG Beyond The Sea Title Tournament. This is another really interesting pairing without a clear favorite. 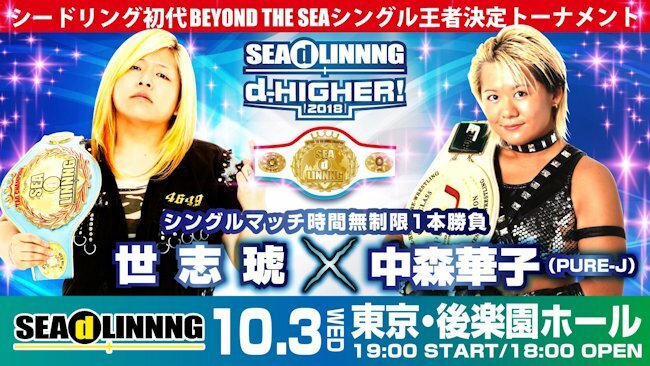 Yoshiko is one of the top wrestlers in SEAdLINNNG and already holds the tag team championship in the promotion. She also is a former OZ Openweight Champion as well as half of the current OZ Academy Champion, and on top of that has only lost two singles matches so far in 2018. Hanako Nakamori is no slouch either however, as she comes into the match the PURE-J Openweight Champion and has been wrestling for 12 years. Plus she is yet to lose a singles match in 2018. So like the last match, this one is also very even on paper between two established wrestlers on impressive runs so far this year. They start fast as they trade holds, Yoshiko gets away and knocks over Hanako with a shoulderblock. Hanako gets back up and kicks Yoshiko before they start trading shots, Yoshiko gets Hanako in the corner and throws her down by the hair. Bootscrapes by Yoshiko in the corner and she delivers the big boot, Hanako recovers but Yoshiko puts her in a stretch hold. Hanako gets a foot on the ropes, Yoshiko charges Hanako but Hanako hits a high kick. Strike combination by Yoshiko and she kicks Hanako in the chest before hitting a senton. Yoshiko gets Hanako up but Hanako gets away, waistlock by Yoshiko but Hanako headbutts her way out of it. Kick by Hanako and she delivers the Shining Wizard, she goes up top and nails the Destiny Hammer, but Yoshiko barely kicks out of the cover. Hanako picks up Yoshiko but Yoshiko blocks the Fisherman Buster, high kick by Hanako and she hits a step-up enzuigiri. She goes off the ropes but Yoshiko hits a lariat, another lariat by Yoshiko and she hits a modified Samoan Driver for two. Yoshiko goes to the second turnbuckle but Hanako rolls out of the way of the diving senton, Hanako goes up top but Yoshiko recovers and joins her. Yoshiko tosses Hanako to the mat by her throat, she picks her back up and delivers the choke bomb but it only gets two. Yoshiko goes off the ropes and hits the sliding lariat, but Hanako reverses her cover into one of her own for two. Step-up enzuigiri by Hanako and she quickly nails the PK for the three count cover! Hanako Nakamori advances in the tournament. This match is part of the first round in the SEAdLINNNG Beyond The Sea Title Tournament. Business continues to pick up, as these two are also very accomplished. Nanae Takahashi is the promoter/owner of SEAdLINNNG and over her 22 year career she has had over 20 title reigns. She is against Hiroyo Matsumoto, a 12 year veteran that last year held the top titles in both OZ Academy and Sendai Girls’. In terms of combined experience/accolades, this is the biggest match of the night and will no doubt be a banger. Nanae attacks Hiroyo in the corner before the bell rings, Hiroyo fights back to the middle of the ring and they enter into a strike exchange. Hiroyo finally knocks over Nanae with a shoulderblock but Nanae immediately returns the favor, backdrop suplex by Nanae and she applies a grounded necklock. Hiroyo gets out of it and hits mounted elbows, but Nanae kicks her off and returns to her feet. They trade a few elbows before Nanae plants Hiroyo with a sidewalk slam, Nanae keeps Hiroyo on the mat and puts her in a sleeper hold. She lets go after a moment and kicks Hiroyo repeatedly, Nanae puts Hiroyo in the corner and chops her repeatedly before knocking her down with a lariat. Nanae goes up top but Hiroyo quickly joins her and hits a superplex, Hiroyo then goes up but she gets joined as well as Nanae hits a superplex of her own. Nanae picks up Hiroyo but Hiroyo chops her into the ropes, Nanae charges Hiroyo but Hiroyo snaps her head on the top rope. Missile dropkick by Hiroyo and she charges Nanae, but Nanae pulls the top rope down and Hiroyo falls out of the ring. Nanae then goes off the ropes and sails out onto Hiroyo with a tope suicida, she then throws a chair at her but Hiroyo throws a chair back as they trade chair shots. Hard elbow by Nanae and she throws more chairs at Hiroyo, Nanae puts Hiroyo against the ring post and chops her but Hiroyo eventually ducks one and Nanae chops the ring post. Hiroyo hits a body avalanche while Nanae is against the post, she pulls Nanae onto the apron and goes for a powerbomb, but Nanae blocks it and delivers a back to belly piledriver on the apron! Back in the ring, Blue Thunder Driver by Nanae but Hiroyo kicks out of the cover. Nanae goes up top but Hiroyo recovers and elbows her before she can jump off. Hiroyo joins Nanae and goes for a powerbomb while still on the top turnbuckle, Nanae blocks it but Hiroyo slides out to the apron and grabs Nanae, powerbombing her onto the apron. Hiroyo returns to the ring and waits for Nanae, Nanae half-slides back in while Hiroyo pulls her up and goes for a backdrop suplex, but Nanae blocks it. Hiroyo keeps the hold applied and hits a wheelbarrow facebuster, she goes up top and delivers the reverse double kneedrop for a two count. Hiroyo picks up Nanae but Nanae elbows her off, they trade strikes until Nanae drops Hiroyo with a release German. Hiroyo quickly gets back to her feet and hits her own German suplex, Nanae gets back up as well but Hiroyo plants her with a roaring elbow. Nanae and Hiroyo end up back on their feet and Nanae hits another back to belly piledriver, she kicks Hiroyo against the ropes but Hiroyo gets up angry and they trade slaps to the face. Both wrestlers collapse to the mat after the exchange escalates to punches, they slowly get on their knees and keep trading elbows. Nanae goes off the ropes but Hiroyo does as well, Hiroyo lariats Nanae to the mat and covers her for a quick two. Jumping kick by Nanae and she delivers a wrist-clutch backdrop suplex, but Hiroyo kicks out of the cover. Nanae goes up top but Hiroyo gets her knees up on the Refrigerator Bomb, Hiroyo picks up Nanae in a gutwrench and powerbombs her for a two count. Hiroyo picks up Nanae and drops her with a more standard powerbomb, but that gets a two as well. Hiroyo goes for the backdrop suplex but Nanae blocks it and applies a front necklock. Nanae lets go and covers Hiroyo, but Hiroyo kicks out. Nanae picks up Hiroyo and delivers the Nana☆Racka, but Hiroyo barely kicks out. Nanae goes for a sliding elbow but Hiroyo moves and hits a sliding lariat of her own, she picks up Nanae and nails the backdrop suplex, but she is too hurt to cover. By the time she recovers, Nanae has rolled herself near the ropes, but Hiroyo kicks her back to the middle of the ring and covers her for two. Hiroyo picks up Nanae but Nanae gets into the ropes to block the suplex attempt, Hiroyo goes off the ropes but Nanae drops her with a lariat. Nanae goes for the One Second EX but Hiroyo gets away, high kick by Nanae and she headbutts Hiroyo repeatedly. Hard lariat by Nanae, she goes off the ropes and hits the Sliding D for a two count. Nanae goes up top and connects with the Refrigerator Bomb, but again Hiroyo gets a shoulder up. Nanae drags up Hiroyo and nails the One Second EX, and she picks up the three count cover! Nanae Takahashi wins and advances in the tournament. 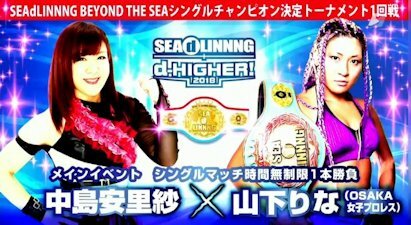 This match is part of the first round in the SEAdLINNNG Beyond The Sea Title Tournament. Arisa Nakajima is currently affiliated with SEAdLINNNG but is best known as the former Ace of JWP, where she held the JWP Openweight Championship five times as well as the tag team championship on two occasions. Rina has only been wrestling for five years but in that time has risen to be one of the top wrestlers in Pro Wrestling WAVE, she also comes in as half of the SEAdLINNNG tag team champions. Arisa has more experience but Rina has been hotter in the last couple years, so it is anyone’s game. Soon as the bell rings they go chest to chest before trading elbows, slaps by Rina but Arisa dropkicks her down. Running boot by Arisa, she kicks Rina out of the ring before going to the top rope and diving down to the floor with a crossbody. Arisa goes to get back in the ring but Rina grabs her from behind and hits a vertical suplex on the floor. Rina slides Arisa back in and boots her against the ropes, she throws Arisa into the corner and hits a pair of lariats. Rina puts Arisa back in the corner and charges in, but Arisa slides out to the apron before coming back in the ring with a slingshot wheelbarrow victory roll into a footstomp. Knees by Arisa and she applies a short armbar, she lets go after a moment and kicks Rina in the arm, but Rina knocks her back when she tries one too many times. Arisa throws Rina into the corner, Rina jumps on the top turnbuckle but Arisa elbows her down to the apron. While Rina is on the apron, Arisa goes up to the top turnbuckle and DDTs Rina into the apron while falling down to the floor. Rina rolls back into the ring, Arisa goes up top and delivers a missile dropkick. Rolling Germans by Arisa and she holds the last one, but it gets a two count. Arisa goes off the ropes and boots Rina in the head, but Rina catches her with a backdrop suplex and a running kick. Rina goes for a cover but Arisa rolls through it and applies an armbar until Rina gets in the ropes for the break. Knees to the face by Arisa and she connects with a running knee followed by a running boot. Arisa goes up top but Rina recovers and joins her, elbows by Arisa and she knocks Rina back to the mat before connecting with a diving footstomp. Arisa goes up top again but Rina gets her feet up on the moonsault attempt, Arisa ducks the lariat attempt and blocks Rina’s sleeper attempt as well before kicking her in the face again. Arisa goes off the ropes but Rina nails her with a hard lariat, another lariat by Rina and she covers Arisa for two. Sleeper hold by Rina but Arisa rolls out of it, she goes off the ropes but Rina catches her with the sleeper again. Arisa struggles but manages to get a foot on the ropes for the break, short range lariats by Rina to Arisa but Rina catches her with the Cutie Special for two. Both wrestlers are slow to recover, they return to their feet and trade kicks and elbows until Rina drops Arisa with a lariat for two. Rina goes off the ropes and delivers the sliding lariat, but that gets a two as well. Rina picks up Arisa and goes for Splash Mountain, but Arisa slides away and hits a snap German. She goes for another suplex but Rina reverses it into a Victory Roll for two, running elbow by Rina but Arisa applies La Magistral for her own two count. Knees by Arisa but Rina hits a pop-up knee to the head followed by a lariat. Rina drags up Arisa but Arisa gets her from behind with a package German. Arisa slowly goes up top but Rina grabs her from behind and goes for Splash Mountain, but Arisa reverses it into a victory roll with a bridge for two. Release German by Arisa and she nails the dragon suplex hold, but Rina gets a shoulder up. Arisa positions Rina, she goes up to the top turnbuckle and she nails the moonsault for the three count cover! Arisa Nakajima wins the match and advances in the tournament. I can’t say enough good things about this show. SEAdLINNNG assembled eight of the best wrestlers they could for their tournament, and all eight brought everything they had. The level of violence and brutality all eight showed can’t be overstated – there was no fluff or pleasantness here, they all put everything out there for our entertainment. The last two matches in particular are two of the better Joshi matches I have seen this year, with the main event being perhaps the best. This event is a must-see, the opener is skippable but everything else is worth a close watch. Track it down if you can.